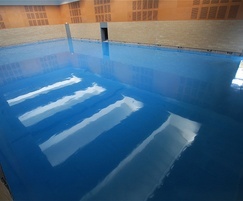 an elite-level strength and conditioning area. 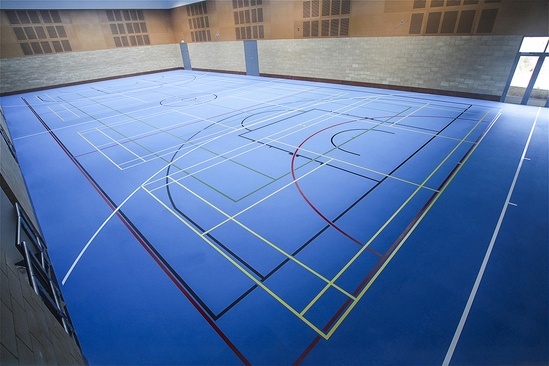 The school appointed UK-based sports and fitness flooring specialist TVS Group to provide a full solution for all three areas. In the strength and conditioning area TVS installed T40 Sportec Style Tiles, a 40mm-thick, interlocking, heavy-duty rubber gym tile. These tiles are manufactured specifically to cater to heavy weight-lifting activities. Despite the irregular shaped room – and the IAAF track running in at an acute angle – the tiles were all installed in one day to create a large open plan free weights area. 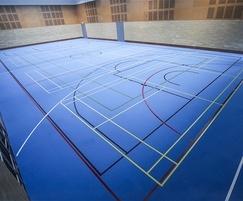 For the sports hall, TVS utilised a seamless, polyurethane, point elastic system, incorporating a four-layer build to ensure a level surface with performance characteristics suitable for multi-sport use. 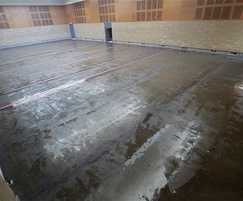 TVS also identified and rectified damp and level issues in the structural sub-base by installing a damp-proof membrane, as well as a self-levelling screed to the sporting areas.